I like a little bit of consistency in life. I just like knowing there will always be blue cheese crumbles at the Whole Foods salad bar even if sometimes they only have fake chicken and no grated zucchini. I like to know that I’ve got party supplies in my desk at work in case I bring cookies in and need to put heart napkins out. 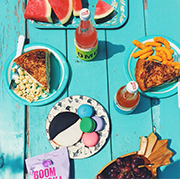 I like to know that without a doubt ice cream can happen and be dreamy, so I’m glad Jeni exists. I like to know that no matter what when I get home Elliot will be waiting holding his favorite bone and that my rain boots are by the back door and that my rainbow fondue pot is where I can see it from any seat in the house. I also like to know that rhubarb is so sincere and consistent. It’s a miracle shade of pink that I’d like to paint my walls, and wear pants and shoes and tights that match. I’d like to get a rhubarb manicure, and keep roasted rhubarb sauce in the fridge for french toast and ice cream. 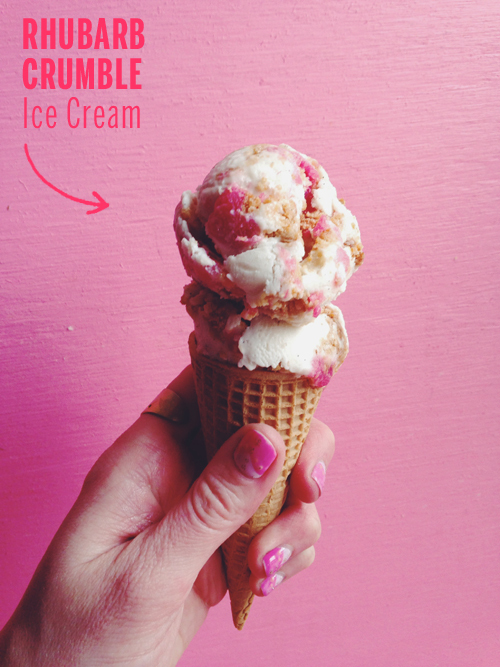 This ice cream is a remix of the Berry Crumble one I made a while back. And just like that one, it tastes like pie. A la mode and all that crap. I bet you’ll love it! It’s sweet and tart and has a crumble crunch, so what’s not to like? I’ll probably make like 4 more remixes to this. Hope you don’ t mind! Make a rhubarb sauce. Place the rhubarb, sugar, and water in a saucepan. Bring to a boil. Reduce to a simmer and cook, stirring now and then, for 20 minutes. Strain, reserving liquid for lemonade or for in cocktails. Set aside to cool to room temperature. Chill in the fridge until time to churn the ice cream. When ready to churn, strain mixture (removing vanilla bean) through a fine mesh strainer. Whisk in 1/4 cup of the rhubarb sauce. Freeze in your ice cream maker according to the manufacturer’s instructions. 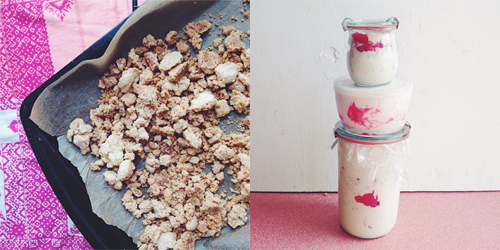 Once fully churned layer in a one-quart container with the leftover rhubarb puree and crumbles. Top ice cream with plastic wrap and an airtight lid. Freeze for at least 4 hours. 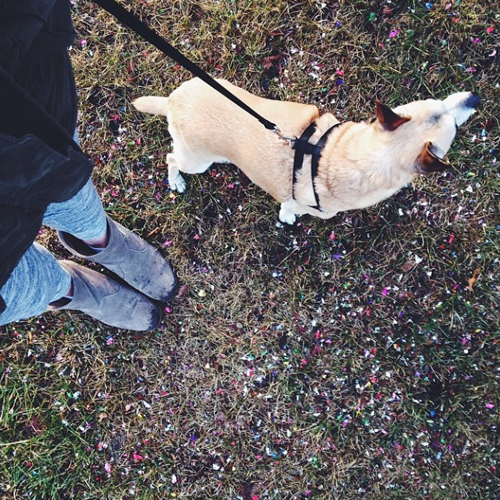 We found confetti on our walk the other day! P.S. All these photos were taken on my iPhone 5 and edited using VSCOcam. LOVE the idea of this, also, can we be co-workers? I want to use your heart napkins when you bring in treats! Way to make the dreamiest ice cream and include rhubarb. Way to let everyone know that rhubarb is cool! This flavour looks seriously yummy. I love it! I’m so excited it’s rhubarb and ice cream season. Way to go combining the two! Oh wow, that looks fabulous! Reminds me I should be getting my rhubarb on this time of year. I’m so excited for baking with rhubarb! Love the idea of it in ice cream. Heart napkins in your desk! You are so adorable. Being your coworker must be a dream! Rhubard is indeed a lovely color, thanks for reminding me! I want this ice cream! 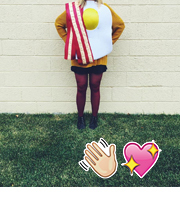 I’m so glad for a lovely gal like you to teach me the non-egg way to make delicious ice creams. I love all your flavors. This one is rad! That confetti looks like a fun surprise too! Yum! 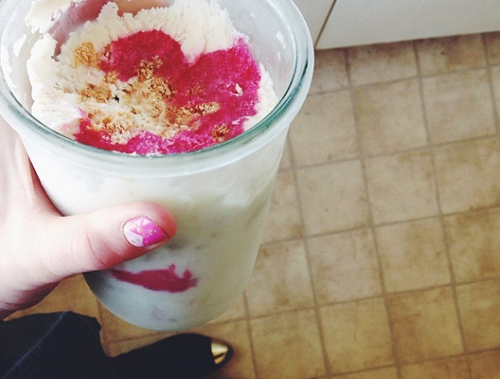 I ADORE rhubarb and ice cream… and rhubarb crumble…and your dog. Let me just sit here and count the ways I love you right now! I just made this for a dinner party tonight and am very excited to try it! A note on the crumble part – I didn’t read as carefully as I should have and used 1 stick of butter despite the fact that it says 1/4 cup right before it. Just FYI! blog.majanett.de - Eiszeit: Rezept für super leckeres Rhabarber-Frischkäse-Eis mit Streuseln – der Sommer kann kommen!